What’s not to love about Chocolate AND Salted Caramel? Both ingredients make my eyes twinkle and tummy growl. Surprisingly, it wasn’t too difficult to make, only the salted butter caramel layer was a bit tedious because I was still getting used to my new kitchen. This is the first time making this and I’m guessing because my layers weren’t in the freezer for long enough, that’s why it kind of collapsed. I also didn’t get golden caster sugar that the recipe suggested, but it still tastes good none the less. Note: Billington, which is available in Woolies, supplies golden caster sugar. 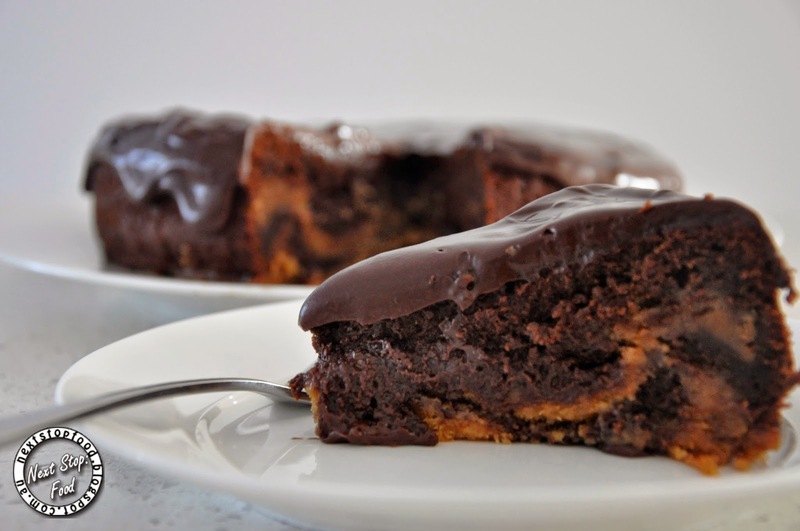 This cake is deliciously fudge-ly rich, everyone liked how the salted caramel layer balanced out the chocolate sweetness. Hope you’ll enjoy the cake as much as I did, happy baking everyone! To make the caramel biscuit, grease 2 x 20 diameter sandwich cake tins (just make sure it’s smaller than your sponge cake tin) and line the bases with baking paper. Put the biscuits into a food processor and whizz to fine crumbs. Put the sugar and water into a heavy-based saucepan and dissolve over a low heat. Increase the heat and cook until it forms a lovely amber caramel. Remove from the heat and carefully stir in the cream, followed by the butter and salt. Stir the biscuit crumbs into the caramel, then divide equally between the prepared tins and press down with the back of a spoon. Place in the freezer to set. In a large bowl, whisk the egg yolks and sugar together using an electric hand whisk until pale and fluffy. Stir in the chocolate mixture, then fold in the flour. In a clean, dry bowl, whisk the egg whites to soft peaks, then gently fold into the chocolate mixture. Remove the caramel biscuit discs from the freezer and remove from the tins, discarding the lining paper. Place one of the discs on the bottom of the prepared loose-bottomed cake tin and spread with half of the cake mixture. Lay the other caramel disc on top and cover with the remaining cake mixture. Bake in the oven for 25–30 minutes until the cake is just cooked – it should be almost undercooked for extra gooeyness. Leave to cool in the tin for 10 minutes, then turn out on to a cooling rack to cool completely. To make the glaze, put the chocolate into a heatproof bowl. Put the cream into a saucepan and heat to simmering point, then pour one-quarter over the chocolate. Leave for 1 minute until the chocolate starts to melt, then gently stir in the rest of the cream until smooth and glossy. 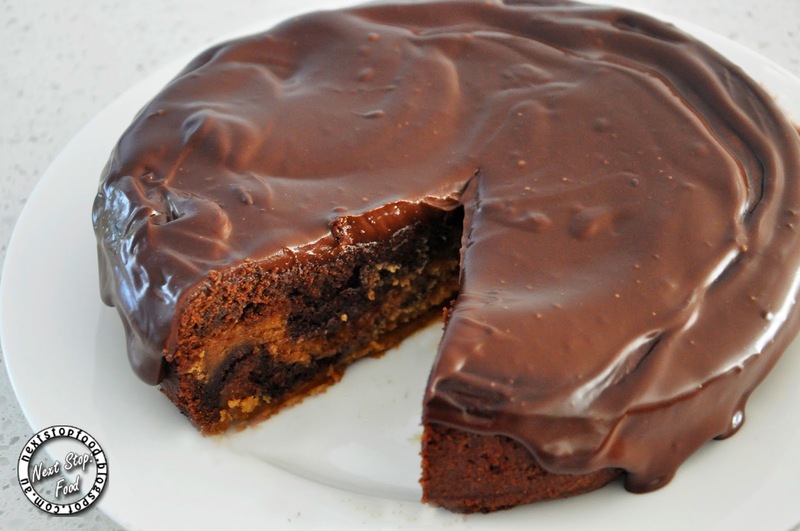 Using a palette knife, cover the cooled cake with the chocolate glaze. Chill in the refrigerator until set before serving. I too love salted caramel and chocolate. 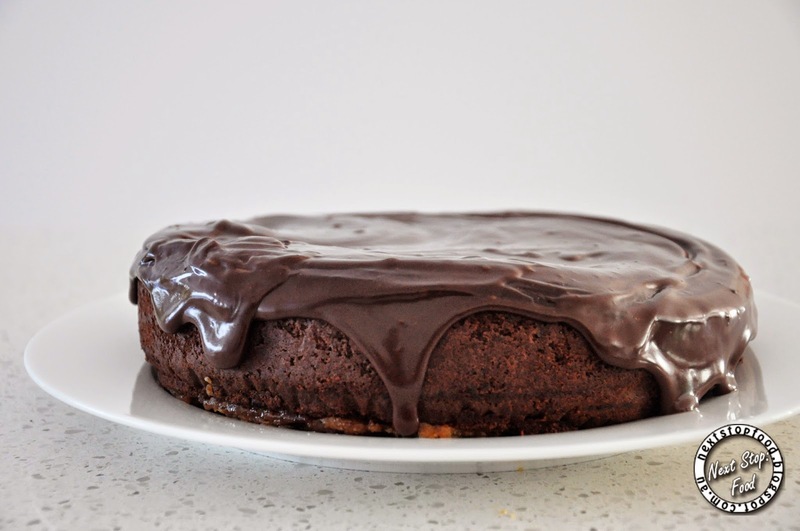 I like the almost marble effect this cake has- looks delicious! omg yes please! i need this now!